With contributions by Emmanuel Alloa, Rüdiger Arnzen, Guy Guldentops, Andreas Luckner, Andreas Maier, Matthias Perkams, Stephan Schmidt, Andreas Speer, Michele Trizio and David Wirmer. Mou Zongsan (1909-1995) has developed a Confucian system of philosophy the central concepts of which emanate from a process of translation of Kantian terminology into Chinese. The essay understands this process as an attempt to reassert Confucian cultural identity under the onslaught of modernity and points out the guiding ethical principles of Mou Zongsan’s thought. Rather than to reject the obvious instrumentalization of Kant’s ideas, the essay aims to provide a perspective from which Mou’s approach can be rendered intelligible. 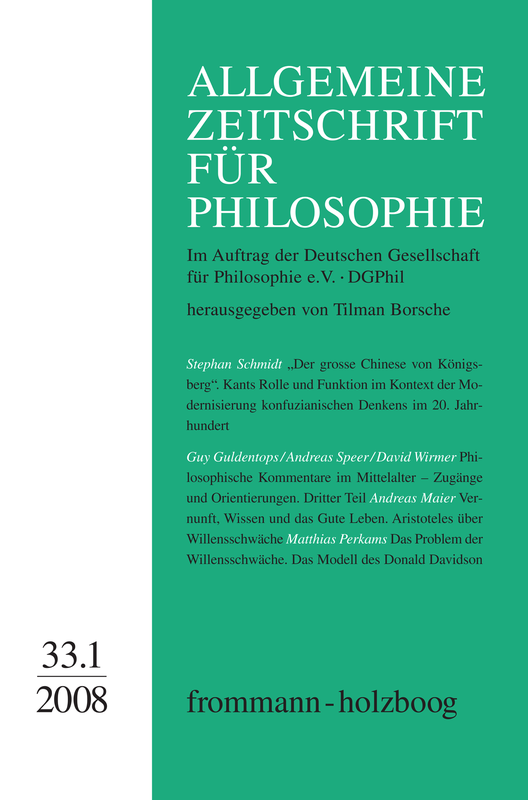 Contrary to Mou Zongsan’s own thinking, however, his project here is not treated as another interpretation of an already well-known subject – Kant’s philosophy – but as the constitution of an entirely new one, namely the Chinese-speaking philosopher Kant. In an essay which by now can be regarded as classical, Donald Davidson claims that there is a clear-eyed akrasia: Somebody may do something intentionally what he thinks to be, all circumstances considered, the worse and avoidable alternative. In order to make this claim plausible, it is necessary to assume that the incontinent person allows himself something like an exception from the rule which is fundamental in Davidson’s thought, i.e. from the principle of continence: Although the agent wants to follow reason according to that principle, and although he regards his all-things-considered- judgement as the expression of reason, he follows a spontaneous wish which he knows to be not recommended by reason in this situation. If weakness of the will is really possible is a highly controversial philosophical question. In this essay I try to show by closely examining Aristotle’s theory of weakness of the will that this question cannot be treated separately but that other substantial assumptions about practical rationality, the concept of knowledge, and the good life have to be taken into account. Andreas Luckner: Felix Heidenreich, Mensch und Moderne bei Hans Blumenberg.